Typically if your band has gone through nearly twenty different members, it’s not a good sign for success. Even if you’ve been around for five decades, that type of turnover generally doesn’t lead to positive reinvention over and over. Today’s band may just buck those stereotypes with over 100 million albums sold worldwide. Peter Green was an acclaimed guitarist for John Mayall & the Bluesbreakers in the mid 1960’s. After he decided to leave, he grabbed some old buddies—one being drummer Mick Fleetwood— to start something new. Peter also recruited bassist John McVie, who he was initially reluctant, but after referring to the band as ‘Fleetwood Mac’ to entice him, he relented. After playing a couple festivals in the London area, the band felt they were ready to make a record. They released a self-titled no-frills blues album in 1968. Seeing little acclaim, they put out a couple singles, one being “Black Magic Woman”—a track that would later be a smash hit for Carlos Santana. A second album was released, and that didn’t create a lot of buzz either. Needing some change up, they moved to the Unites States in 1969 and recorded songs for a label that would soon after go belly-up—something that would ultimately end up being their saving grace. Fleetwood Mac then signed with Warner Bros. Records and shed the blues-only genre. Apologies, but I’m going to virtually skip through an entire storied era for the band for this post. Going another new direction, the band added guitarist Lindsey Buckingham only on the condition his girlfriend Stevie Nicks could also join, performing vocals. Their first female lead record was a success, and anticipation from the label was incredibly high for the follow up. Behind the scenes, Buckingham and Nicks were constantly fighting, and John McVie and his wife (who joined the band as a keyboard player) were going through a divorce during the recording of the album. On top of that, it’s widely known the entire band were heavy cocaine users during the recording sessions. Despite all that animosity and potential for the whole thing to implode, the album did nothing but create magic. 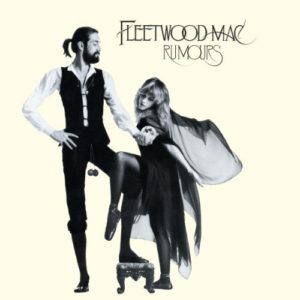 If the sales weren’t enough, Fleetwood Mac took home the Grammy Award for Album of the Year in 1978. The Guardian has it at #78 of the best 100 albums ever and Q magazine put it at number three in the best 50 albums of the ‘70s. There are another dozen publications that have it on some sort of ‘best of’ list. It’s an absolute five star album across the board critically, and it’s easy to hear why. For an album that’s only about 40 minutes long, it’s chalked full of eleven top notch tracks. I guess you could label it pop if you had to, but not growing up in the era, it seems maybe a little more contemporary, with a mix of blues and rock. The hits are still hits on radio today, and have held up incredibly well against father time. The band is currently on their “An Evening with Fleetwood Mac” tour and in spite of another couple decades of lineup changes and drama, the key players are still part of the band and the tour. Rumours is a part of history—literally, this year it was preserved in the National Recording Registry by the Library of Congress. With praise that high, I can’t begin to explain how much it’s worth your $7 bucks today. Once you pick it up, you’ll never go back again. One of the best albums of all time, no question. An iconic band, and discovering Nicks was a masterstroke, amazing! Thanks for reading Patrick! Couldn’t agree more, such an iconic band and paved the way for so many others. I skip over the Bob Welch era too!